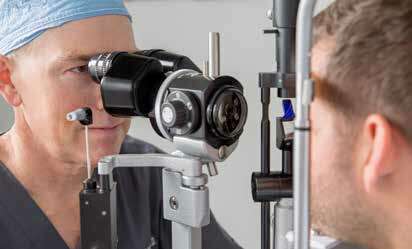 The purpose of the initial consultation with an eye surgeon is to help you decide whether to have surgery and which procedure you want to have. Your preoperative evaluation is your chance to figure this out by consulting with an expert surgeon. This consultation takes about an hour to an hour and a half, and is often complimentary. During the initial consultation, some basic measurements are taken of your eyes. You should do four things to prepare for your initial consultation. First, make a list of the questions you want answered. A written list ensures that you don’t forget anything and helps the surgery center be sure you are fully informed. Second, bring all the glasses you routinely wear, and your contact lens prescription if you have it handy. The third preparatory step is to stop wearing your contact lenses for seventy-two hours prior to the appointment (other centers may request a longer or shorter period). Just as shoes can distort the shape of your toes, contacts can distort the shape of your cornea. After seventy-two hours, most people’s corneas return to their normal shapes. A normal corneal shape is important for the surgeon in taking accurate measurements. The fourth preparatory step is to gather your medical and eye history information. Get together a list of your medical problems and current medications, including over-the-counter meds. If you have had previous eye surgery, know the dates and the procedures that were done. Old records can be helpful, if available. If your vision has changed recently, old prescriptions are useful so the surgeon can see how much change has occurred. Your preoperative evaluation shouldn’t be rushed. You shouldn’t feel like you are on an assembly line. If you aren’t given the chance to meet the surgeon, you should leave. You should have the opportunity to ask as many questions as necessary in order to feel safe and comfortable undergoing surgery. You may want to invite a friend, your spouse, or another family member to sit in on the meeting with the surgeon. He or she may help you remember questions to ask or may help you recall information later. You shouldn’t feel pressured to have surgery. Unfortunately, some LASIK centers use a high-pressure sales approach, almost like selling used cars. There is some chance that these centers may recommend LASIK even if you are not a good candidate. If you feel you are getting a sales push, leave. LASIK is a medical procedure and should be treated as such. At the end of the consultation, the surgeon will recommend the procedure that would likely be best for you. You’ll be informed about the expected results with the recommended procedure and have all your questions answered. You should then have all the information you need to make a decision about whether you want to have vision correction surgery. If you want to proceed with surgery, the next step is the comprehensive eye exam. This may be done at the same appointment as the consultation, or you may return at a later date for this part of the preoperative evaluation. A careful eye exam is necessary to be sure your eyes are healthy and to find any conditions that might result in a less-than-optimal result. In the last chapter, I indicated some of the most common conditions, but those were only a small fraction of the possible conditions that affect the eyes. The surgeon’s responsibility is to make sure there aren’t any others, and, if there are, to let you know about them and discuss them with you. If you are considering corrective eye surgery, such as LASIK, your ophthalmologist will perform a more in-depth exam of your eye structures to determine whether you are a good candidate for surgery.